Blue Raider Peyton DePriest rushes past a Volunteer defender in an attempt to get upfield (Devin P. Grimes/MTSU Sidelines). Peyton DePriest shined as the Middle Tennessee Blue Raiders (2-4) defeated Kennesaw State (5-2-2) by a final score of 2-1. Taylor Hatch scored the game-winner with a header from a corner kick to give the Blue Raiders their second consecutive victory. The Owls broke the ice on a goal in the 54th minute to give the Kennesaw State a 1-0 lead. Middle Tennessee’s Sam Debien responded a mere seven minutes later by kicking the game-tying goal, a score that set up Hatch to seal the deal. 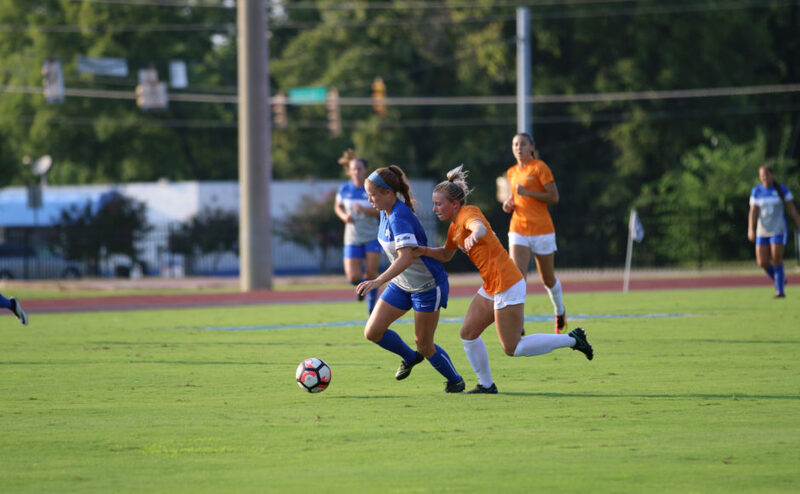 Amber Hoot and Peyton DePriest notched an assist each to help lead Middle Tennessee to their second win of the season. With conference play on the horizon, the man in charge knew that this was a must-win game for his team. Kennesaw State proved they’re a tough team by committing 15 fouls in the game, including two yellow cards. The Owls’ physicality led to a couple scary moments when Peyton DePriest was knocked to the ground after jumping for a ball in the air. Carolin Engelhard also writhed in pain when a Kennesaw St. player kneed her in the leg. Engelhard left the game after that play, but is considered healthy. Rhoden knows that even though it was a chippy game, he believes that his team can use what they learned moving forward in the season. The Blue Raiders are now 2-0 when they out-shoot their opponents. They created ten shots (five shots on goal), while Kennesaw State only shot six times (two SOG). In MTSU’s four losses, they were out-shot each time. Shot creation is where their young forward group is bound to shine. With raw talent, it’ll take some time, but as the season progresses, MTSU’s offense will continue to grow. The Blue Raiders will be back in action on Sunday, when they take on the Evansville Aces at 5 p.m. at Dean A. Hayes Stadium.